Be the first to share your favorite memory, photo or story of Dennise. This memorial page is dedicated for family, friends and future generations to celebrate the life of their loved one. 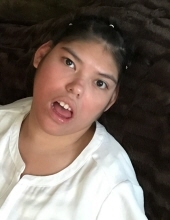 Dennise Valdez, age 19 of Breckenridge, passed away Thursday, April 11, 2019. Funeral Mass will be held at 3 p.m., Friday, April 12th at Sacred Heart Catholic Church with Father Virjil Lawrence officiating. Dennise Estefania Valdez was born November 21, 1999 in Breckenridge, Texas to Esteban Valdez and Janine Jaquez Valdez. She graduated from Breckenridge High School in 2018. Dennise was a member of Sacred Heart Catholic Church and loved music. She was preceded in death by her grandfather, Jaime Jaquez. "Email Address" would like to share the life celebration of Dennise Valdez. Click on the "link" to go to share a favorite memory or leave a condolence message for the family.